Did you know that over 85% of mothers of multiples experience some form of postpartum depression (PPD) and/or postpartum anxiety? Because our bodies experience such high “highs” in hormone level, we can hit bottom very fast after the delivery of our children. Did you know that you can experience PPD up to 12 months after the birth of your children? It can take that long for your body to adjust back to it’s normal levels. Did you know that pregnancy related problems like preeclampsia, gestational diabetes, thyroid issues, and preterm labor often increase the chance that you will have PPD. Pregnancy related issues can cause moms to feel guilt and sadness more often then moms who had a flawless pregnancy. What is PPD? Postpartum depression, sometimes called “Baby Blues”, is a moderate to severe depression that occurs after a woman gives birth. 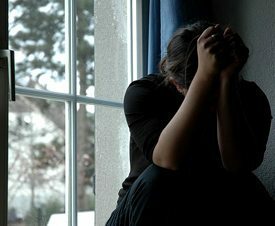 This depression is caused by the hormonal changes that typically occur with any pregnancy. 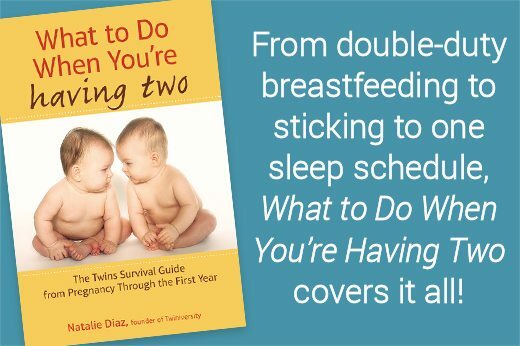 How do I know I have PPD? There are many symptoms of PPD. A wonderful article I’ve found during my research on this subject is called The Symptoms of Postpartum Depression & Anxiety (in Plain Mama English). The website where this article is found is FULL with unbelievable information for anyone suffering from this issue. I think I have PPD, what do I do now? There are many different levels of severity of PPD from crying at commercials to abandoning your family. If you are reading this and think you may be suffering from PPD, I’m happy you are here. The first thing you need to do is tell your partner how you feel. Explain to them that you feel upset beyond what you think would be “typical”. A great next move would be to ask them for a bit of help with the children so you can take a breather. You need to get all your feeling out in the open and not be shy about it. PPD is a common issue that many mothers of multiples are plagued with. This is also a great time to reach out to your local twin club or post a message in our Twiniversity Forums. We already have many posts about PPD, just search the keyword in our forums. If after talking to your spouse, taking it easy a bit, giving yourself some space, is still is not making you feel much better, call your OB. If you don’t feel comfortable, have your spouse call. They can help you decide what is the next best step for you. When my twins were born in 2004 at 34 weeks thanks to pre-eclampsia, I can clearly remember being overwhelmed like any mother of multiples. These feeling didn’t get any better as time went on, they actually got worse, much worse. When the twins were less then a month old and still in the NICU, I can remember saying to my sister “I have to go. I can’t do this.” I really wanted to leave the hospital and abandon the babies and my entire family. I was sure that they would all be better off without me. In my heart I believed this to be true. 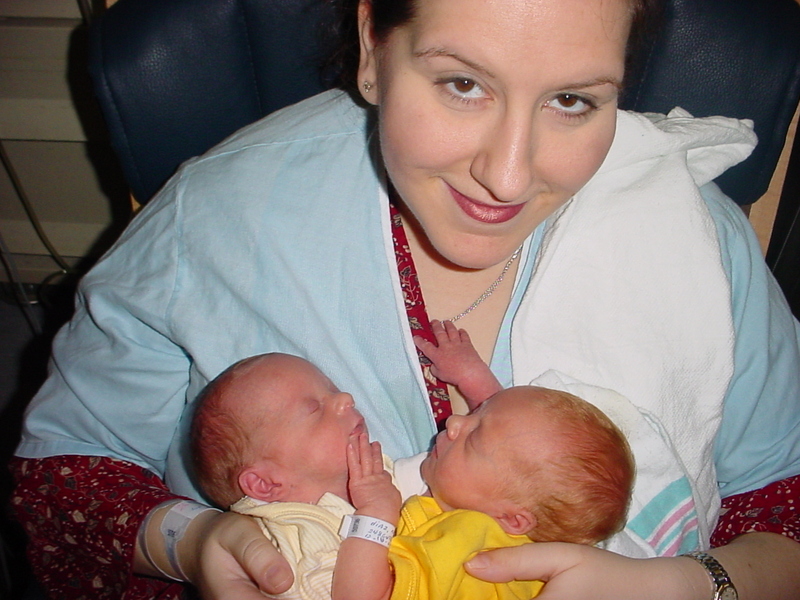 Nat, a PPD sufferer, and her twinnies when they were still in the NICU. I felt like a total failure. I felt that since I could not hold these babies in my body to term (born at 34w on the day), that I was not capable to care for them, and that they would be better off with another mother. These feelings got worse and worse. Once the babies got home (Baby A was in the NICU for 31 days) things got even worse. I stopped sleeping, I stopped eating, I stopped washing and caring for myself in total. The babies weren’t my responsibility… they were my obsession. I had them on a militant 4 hour feeding schedule and that was what my world revolved around. There was no joy. There was no happiness. There were just a lot of babies that I felt cried 24 hours a day. My husband took the typical paternity leave after the kids came home from the NICU, but took another 10 days when the kids were around 2 months old. He noticed that I was really not in good shape and that he needed to be there for me. God love him for that. He was right. Then one day I had what I call my “Memoirs of a Geisha Moment”. No, it has nothing to do with Geisha’s, lol, it was just where my husband pushed me out of the house and I went out alone for the first time after the kids were born. Yup, to see Memoirs of a Geisha. This little time away gave me a minute to clear my head and realize that I wasn’t right. I noticed that I had taken a bad turn and I needed help. I was never “there” for my family. Yes, the kids were safe, clean and fed, but I had barely any memory of the first three months of their life. I can remember looking at pictures CONVINCED that someone had photoshopped me in because I couldn’t remember that. I couldn’t remember family visits, babies firsts, and many things that a mom should be there for. I called my doctor from my cell in the street, crying. She was wonderful. She was patient, kind and understand. She didn’t judge me or make me feel guilty for feeling like I couldn’t take it. She explained to me why mothers of multiples have such a hard time and it goes back to that HIGH HIGHS and low lows. My body had crash landed after the birth of the twins and it wasn’t able to recover on its own. Medication was prescribed, and time also healed my wounds. My husband was my rock, and not matter how mad I get at him for NOT unloading the dishwasher or some other mundane household chore, I think about how without him I might have stayed in that funk for much longer. Thanks babe. 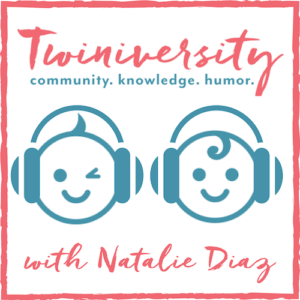 Now in Twiniversity Classes we talk openly and often about PPD. I give moms and dads a heads up that this MAY happen, and if it does, that there is help for them. I give them some tips on combatting PPD. Tomorrow I’ll cover some PPD tips. I want to leave this post with this, PPD was horrible. Maybe the worst time in my life, but once the clouds parted, I was able to breath and enjoy being a mom. 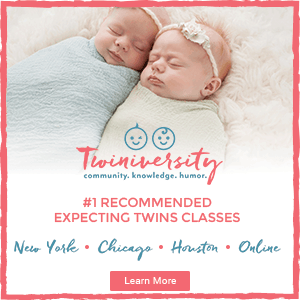 If you should experience PPD, reach out to your local twins club, our online forum community or even me. Natalie@Twiniversity.com I understand and maybe (if you let me) I can help. Did you suffer from PPD? What helped you get through it?